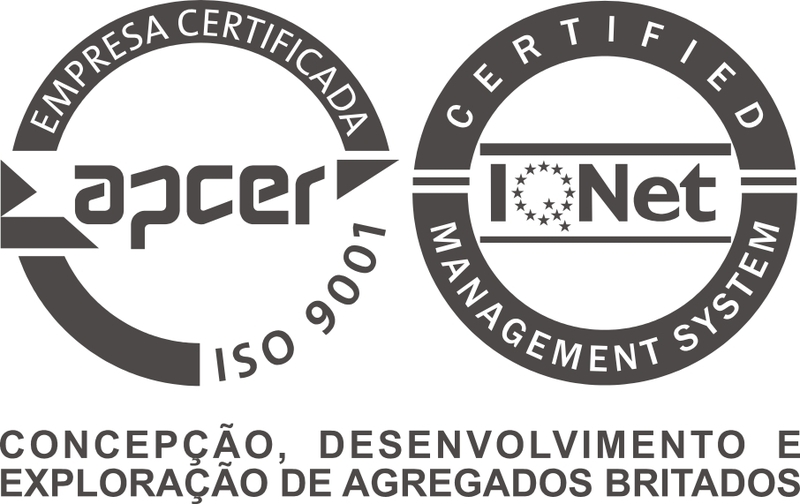 Irmãos Cavaco, S.A. acts as a service provider in areas such as hydraulics, environment, energy and infrastructures. Exploration of aggregate and finished concrete is, also, an area of intervention and tradition. Beyond national territory, Irmãos Cavaco, S.A. operates, still, in PALOP’s, MAGHREB countries and in Martinique. Road construction of about 800m extension, with dual carriageway and a total width of 13m, pavements on each side and a bicycle path. This road was constructed on a platform conquered to the sea by landfill that implied the execution, in all its extension, of a maritime work frontal protection type. Construction of a marina and access channel contemplating dredging; submerse blasting and excavations; seaside retention in rockfill; construction of a quay; supply and installation of floating gangways guided by tubular stakes to berth 470 boats. Design and execution works that consist of the construction of two underground parking lots with a total capacity for 876 places. The “Parque da Frente Ribeirinha”, parking lot with 2 floors with a gross area of about 12,800m² has a capacity for 480 places. The “Parque do Anel Verde”, parking lot with 3 floors, has a capacity for 396 places. This job order consists of the 200 meters north jetty extension, according to the final section alignment of the existing works. A new navigation channel definition with a slight southward rotation as to the current alignment, 200 meters bottom width and a navigability depth of - 12.5 meters (Z.H.). Dredging of a channel with the same characteristics as the previous one on the approach area, outwardly the jetties. This channel, with a 060º/240º alignment, will be enlarged with a 50 meters safety strip on each side and must be dredged to a depth of - 13.2 meters (Z.H.) to ensure a navigability depth of - 12.5 meters (Z.H.). Maritime signalling for the new line of entries and exits of vessels. Design, construction and exploitation and maintenance of an underground and surface parking named Parque Avenida, of about 11,000m², with approximately 400 underground parking spaces. Construction of a multipurpose hall with a gross area of approx. 7,933m² consisting of a multipurpose room with an area of 2,410m² equipped with a telescopic seating system enabling the realization of a wide range of events; an auditorium for 120 people; a large plaza, with multipurpose nature, intended to held the weekly fair, served by a small commercial building, with an area of 700m², functioning on two floors to house a bar, several commercial spaces, shower facilities and changing rooms and, at its northern end, a car park, with four underground floors with a capacity for 201 places. This job order consists of the construction of a protective dyke in the order of 370 linear metres of development. This dyke serves to protect the marine platform on which the pumping station will be built for the refrigeration circuit of the Koudiet ed Draouch combined cycle station’s turbines. The dyke is constituted by a core in TOT protected with layers of filters and a protection mantle in selected rockfill. Execution of bottom dredging works. The new Marine Terminal (Portas do Mar) was built in the Commercial Porto bay of Ponta Delgada. This important infrastructure has enabled the creation of a quay for cruise and a quay for inter island cruise of approx. 390m long; an honour quay of approx. 145m long; a parking with capacity for approx. 220 cars; a new marina with capacity for approx. 454 boats including respective support buildings; a building for the maritime terminal and shopping areas; a multi-purpose pavilion (Pavilhão do Mar), with a restaurant, an outdoor theatre and a natural pools supporting building, including locker rooms, parking exit ramp and a seaside access ramp. All these works were built on a platform conquered to the sea. Construction of a leisure port to park 159 vessels constituted by: orient breakwater with about 320m long with extrados coated with Antifers, intrados coated with selected rock fills and solidified crest by a concrete superstructure: west breakwater with about 110m long with solidified rock fills at its crest by a concrete superstructure; Boats ramp; Vertical wharf quay; seaside retentions. Repair works on the exterior slope of the breakwater at Port of Oran. Slope reprofiling and filling works with TOT, the placement of selected protection rock fills, with calibres that vary between 1 and 6 tons and the placement of 40, 50, 55 and 62 tons “Antifer” blocks. The purpose of this job order was the restructuring and consolidation of the spurs at Restinga and Ofir, with the re-profiling and placement of rock fill of various ranges, depending on the area of the spur. The works carried out on the two spurs were identical. They consisted on the reconstruction of the head area with rock fill from 60 to 90 kN as well as the execution of a bench at the base of the slope. On the existing holes was placed rock fill from 100 to 500 kN and the slopes' trunk of the spur were re-profiled with the placement of rock fill from 30 to 60 kN. The rooting took rock fill from 10 to 30 kN, and the spur of Ofir had no change to the existing profile, lowering the elevation of the existing crest by 1 meter and on the spur of Restinga were removed the light stone rows on the first 50 meters of the rooting whilst respecting the existing levels. Construction of three protection works. The 450m North Breakwater was carried out founded in caissons and topped by a superstructure in concrete. The works included also sand dredging and its placement on the Sand Spit (Cabedelo) to improve the navigational conditions. A 500m detached Breakwater consisting of a core and interlayers of protection in rockfill and of a protection mantle in high density concrete Antifer blocks and sand spit (cabedelo) reinforcement works which develops on 460m beach lengthwise. Construction of a Fishing Port with a 20,000m² basin, made up of; a 400m breakwater to the north coated with 2020 3.6 ton acropod, with 1973 12ton acropod and 609 9 ton cubes; of a two dimensional 145ml wharf quay; two 6m wide portage ramps; 120ml rockfill marginal protection. Urban rehabilitation works for the city of Espinho, with an intervention area of 22,700m², which included remodelling and modernization of the infra-structures for water supply, sewage and river water drainage, irrigation and fire network, electrical and telephonic network and pedestrian and road pavements. Construction of a quay on 12.00m share board stakes, with 78m wharf length and two 20m side walls. This quay is connected to an existing wharf by an embankment about 35m wide in TVC finished with bituminous concrete. Construction of marine infra-structures at the Marina of Portimão, comprising: dredging and excavation to create two basins to berth 630 boats; creation of a platform conquered to the sea by landfill for the real estate project; construction of a protective breakwater and a wharf quay on concrete blocks. The works included also the seaside retentions, pile driving for gangways and the creation of an artificial beach. The building of the Povoação Indoor Pools Complex consists of an underground technical floor, a ground floor where you can find all the main areas and a top floor with toilet and terrace bar. In the main body of the building are the tanks of the pools: for competition and for learning. Remodelling and expansion of the Faro North-West Wastewater based on a biological activated mud treatment system for 45,000 inhabitants including the deactivation of a lagooning, the consolidation of land in the intervention area, the execution of reservoirs, buildings, infra-structures, roads and landscaping and the provision and assembly of equipment for effluent treatment. Construction of two sea outfalls for the Beni Saf desalination plant (Algeria). One, consisting of a 1,200m long, 2.4m diameter pipeline, for supply of seawater for the desalination plant. Rehabilitation and expansion of a Wastewater Treatment Plant (WWTP) with a biological treatment system using activated sludge, for 138,164 inhabitants, including the construction and rehabilitation works of: a wastewater collecting (Boliqueime Pump Station and collecting tank); screening channels and desanders / degreasers and a technical building; flows distribution works; bioreactor; air production building; secondary clarifier and sludge recirculation station; distribution and recirculation tank of the percolation beds; UV disinfection building; primary clarifiers; power supply unit to the provisional station; pumping station of the percolation beds, two percolation beds, secondary clarifier; two maturation lagoons; new sludge thickener; sludge dewatering system; rehabilitation of two sludge pumping stations.